Looking for the best dog food for puppies can be scary. It’s tough to know what to feed a growing puppy, and it’s tough to know how much to feed them. In fact, feeding your pup a food﻿ designed for adult maintenance can be dangerous. Plus, there’s just a lot to take into account if you want to make sure your puppy’s getting all the nutrients she needs. And we can help! We’ve consulted a few dog experts, done a bunch of research, and drawn on our own experience owning a few puppies. We’ll walk you through some of a puppy’s nutritional needs and then give you some specific food recommendations you can take with you. Puppy Nutrition 101: What Makes a Good Puppy Food? What Exactly is Puppy Food? Do I Really Need It? When Do I Switch to Puppy Food? Do I Need Breed-Specific Puppy Food? How Do I Know if a Particular Food is Safe for My Puppy? How Often & How Much Should I feed My Puppy? Should I Keep an Eye on My Puppy’s Weight? Perhaps the best way to go about finding the best dog food for puppies is to start with the best dog foods overall. Or, rather, to understand what makes a good dog food. Plenty of good sources of animal-based protein. Our rule of thumb is that any dog food your feed your dog should get at least a quarter (25%) of its calories from protein. In fact, PetsMD (WebMD's veterinary science-backed publication on pet health) recommends that puppy food contain at least 30% protein. At bare minimum, protein should be the main ingredient, and it’s usually best if that protein comes from a good, recognizable (non-generic) meat source. Most of the time, that’ll mean whole meats. But meat meal (basically meat concentrate) is okay, too. Dogs do need carbohydrates. But lots of big commercial companies tend to put in simple, low-quality carbohydrates, like sugar, corn and molasses. We prefer foods that have lots of food, complex carbs in them, like sweet potatoes, brown rice, oats, and barley. And our favorite carb to see is sweet potatoes, since it’s a super-natural, grain-free way to get carbohydrates as well as a bunch of other nutrients. High in good fats (except for large-breed puppies). Unless you have a dog with pancreatitis, a sensitive stomach, or just a dog that needs to shed a few pounds, we like to see quite a bit of fat. And we especially like to see good sources of omega fatty acids. In most dog foods, those will come from fish and flaxseed. Having good fats with adequate omega fatty acids is essential for lots of stuff, but it mainly helps keep your puppy’s skin and coat healthy. For whatever reason, some big commercial dog food companies put weird fillers in their food. Just take a look at the nutrition labels for some of them. It’s not uncommon at all to see a dog food in which corn is the first ingredient. How gross ins that? Lastly, it’s important for a puppy to have all the essential vitamins and minerals to keep him healthy. Some foods include those as supplements. We liked to recommend foods that include them in the form of fruits and vegetables. Here's a great video guide on how to pick a good puppy food by Dr. Katie Nelson. In general, yes: it’s a good idea to buy food formulated specifically for puppies. If you’ve never owned a puppy, you’re in for a shock: they grow fast. Honestly, they’re like little 3D printers on overdrive, turning everything that goes into their mouths into body mass. Because they grow so quickly, they need about twice the calories as an adult does. That doesn’t mean that they need twice as much food; it means that puppies need twice the calories per pound of bodyweight as adult dogs. Not only that, but every part of your puppy’s body is growing: their organs, their bones—everything! So they typically have higher vitamin and mineral requirements than mature pooches. Many of these nutrients aren’t necessary for older dogs. Puppy foods—especially the good, well-balanced ones—are designed with all this stuff in mind. They are usually much more calorie-dense and contain all the vitamins and minerals your pup needs to grow into a healthy, happy adult dog. In general, you should safely be able to switch your puppy to solid food when she’s about four weeks old. However, this can vary from breed to breed, so check with either your vet or your breeder (or both) to ask what your individual puppy needs. But usually, at four weeks, puppies can’t get enough calories from their mother’s milk. Some small-breed puppies are weaned a bit later (because they don’t need quite as many calories), but almost all dogs make the transition to solid food in about six weeks. That said, eating dry food for the first time can be difficult for some puppies. If it’s tough for your dog, you can add a bit of water to her food. This will give a moist, spongey texture, and it should be much easier to eat. The quick answer here is no. However, it’s slightly more nuanced than that. Different dog breeds absolutely do have different nutritional needs. For example, large, playful dogs like Golden Retriever are plagued with hip problems, so it’s good to find a dog food that includes glucosamine, which protects bones and joints and can significantly add to the “quality” years of a Golden’s life. Or, for example, some dogs have problems keeping their coats and skin healthy, and these pooches often need a food with higher fat content. Still other dogs are prone to allergies. You get the idea. For puppies, though, the breed-specific food requirements don’t necessarily matter as much. First, breed-specific foods mostly address problems that occur later in life, and puppies don’t really need to worry about them. Second, puppies generally need to focus on one thing: growing. So, while there are breed specific puppy foods out there—and while some of them are certainly very high quality foods—they’re mostly just redundant. In other words, you do need food formulated for puppies, but you probably don’t need a puppy food formulated for your specific breed. Large-breed puppies do need different food than their smaller counterparts. When puppies are born, their bones are still developing. For large breed puppies, however, bones grow more and longer, which, according to Hills Pet, makes them much more susceptible to bone disease in their first year. Did you know that most large breed puppies will reach half their total adult body weight in just 5 months? Seriously, they grow fast. The trouble with large breed pups occurs when they grow too fast, which increases the risk of bone and joint problems. So, bigger breeds usually need help moderating their growth, aiming for an average growth rate (instead of growing as fast as possible). To do this, bigger pups need less fat and less calcium. Food with higher fat content can cause quicker weight gain. Too much calcium, on the other hand, can lead to bone problems (which is often problematic, since people often think growing dogs need more calcium and will even feed puppies calcium supplements). The easiest way to do this is to simply buy a puppy food formulated for large breeds, like those recommended in this article. You’re in luck! There’s a pretty easy way to tell. And it’s a good thing, too, because if you had to check for everything yourself, you’d probably go insane. I know I would! There’s actually a regulatory body set up to make sure a food’s safe for growing puppies: Association of American Feed Control Officials. They have an extremely detailed list of what has to be included for a food to meet their standards of safety for a puppy. And it includes a lot of stuff—37 different nutrients, 10 amino acids, 12 minerals and 11 vitamins to be exact. So just look for those phrases first, and then look for AAFCO’s seal of approval to double-check if a food is safe for a puppy. You should feed your puppy between three and four times per day. Puppies need smaller, more frequent meals (as opposed to the one or two meals a day an adult dog might eat), since their tiny little digestive systems are just starting to form and smaller meals are easier to digest. You can move to two meals per day as early as six months old, but try to hold off a little longer if you have a larger breed, especially if that breed has a deep chest cavity (e.g. dobermans, labs), since they’re prone to gastric dilatation volvlulus. Yes! A chubby puppy is likely an unhealthy (or soon-to-be unhealthy) puppy. There’s been a myth floating around forever that high-protein dog foods cause puppies to gain weight. That’s not true, of course, and it likely originated from people overfeeding their puppy foods that happened to be high in protein. But it is something you want to watch out for. Obesity can lead to all kinds of problems, not the least of which are things like hip dysplasia and hypothyroidism. There’s no magic age. Some dogs mature faster than others. 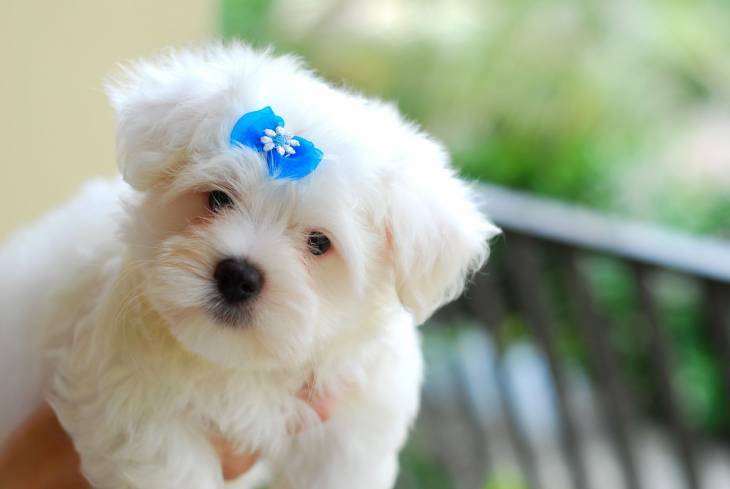 For example, smaller dogs tend to mature more quickly than bigger dogs, so you can make the switch a bit sooner with a Maltese than you can with a lab. Tiny dogs tend to reach maturity at around the one-year mark. Medium dogs reach maturity at around 12-16 months. And bigger dogs become adults at around two years. So, if you’re unsure, the golden rule applies: ask your vet! Or just watch this awesome video from Expert Villiage. We wanted to point out that we’re assuming your puppy is older than 8 weeks old. For the first 6 to 8 weeks of a dog’s life, they should be with their mother, and they should nurse pretty much when they feel like it. Then, they should be weaned off their mom’s milk and onto solid food. If you’re getting your puppy from a breeder, they’ll almost certainly do this for you (in fact, they will do this for you unless they’re a super shady operation). 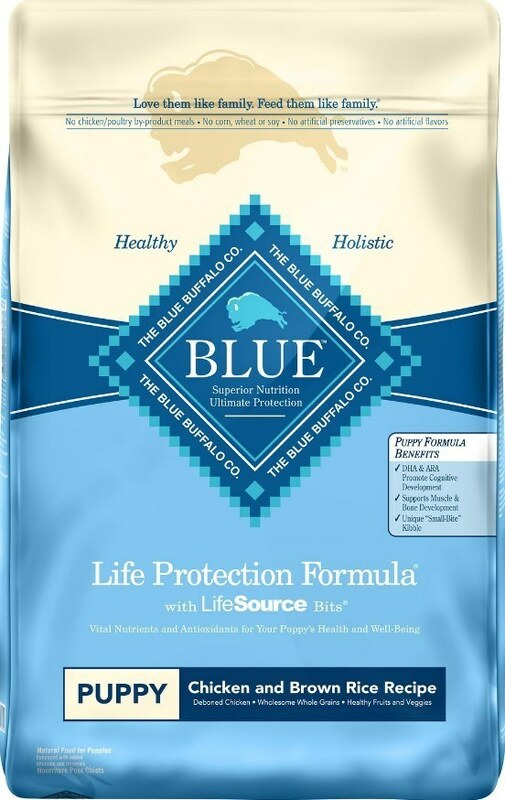 Blue Buffalo is one of our go-to brands, and their puppy food is about as good as any. The ingredients are all very good, and it’s got lot of the stuff we’re looking for a good puppy food. 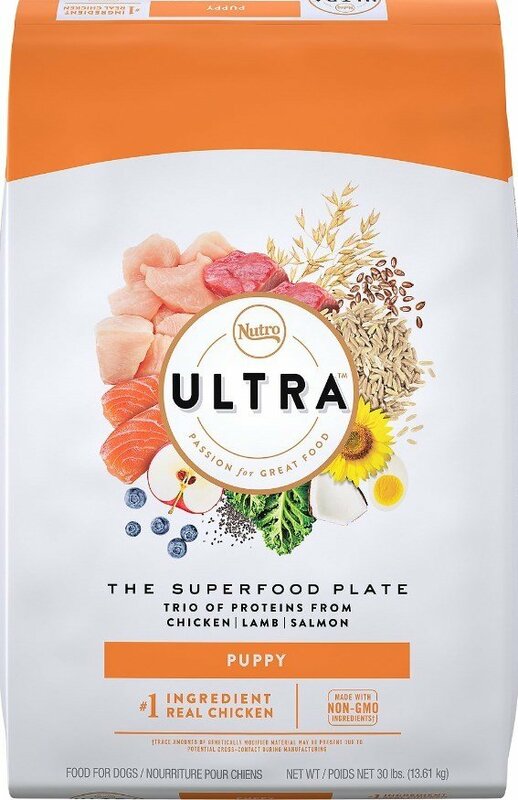 The main ingredient in their puppy recipe is deboned chicken, and the second ingredient is chicken meal, both of which contain glucosamine, which helps keep joints healthy. It also makes it a good choice for bigger puppy breeds that are prone to hip problems. The carbohydrates here all come from good, complex sources, like oatmeal, brown rice, and barley. There’s also a lot of great produce in this formula, including peas, potatoes, carrots, sweet potatoes, blueberries, cranberries, apples and a few others. Overall, this is a great one, and we recommend it. This is another strong contender. It’s a good recipe with plenty of protein and lots of good veggies. The main ingredients here are chicken and chicken meal, and the carbohydrates come mostly from brown rice. We really like that there are a few sources of omega fatty acids: flaxseed and fish oil. These should help your puppy’s coat come in nice and shiny. Plus, there’s a big ol’ basket of produce. This food includes pomegranate, blueberries, cranberries, pumpkin, spinach and carrots. So it’s a pretty good nutritional profile. We honestly didn’t have much experience with this brad before reviewing it for this article, but it performed pretty well, and it has a pretty good (if rather standard) list of ingredients. What we really like about this particular dog food is the quality of the ingredients. The main ingredient, for example, is whole, farm-raised chicken. However, there aren’t as many vegetables as we typically like to see, although there are some. And that means that there are lots of vitamin supplements. It’s not as good as some of the others on the list, but it’s good if you need a puppy food in a pinch. 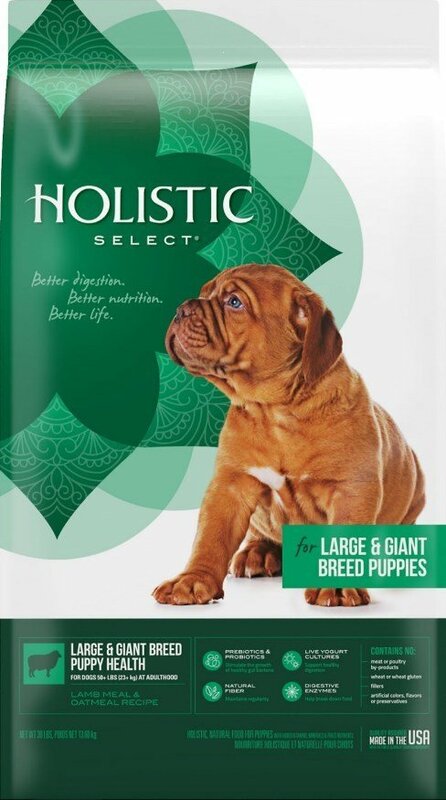 We included this puppy food on our list because—well, first, it’s just a good food—but also, it’s formulated specifically for large breed pups. That more or less means that they were careful to include a lot of glucosamine to help keep a large puppy’s joints and bones healthy. The other stuff is good, too, though. The main ingredient in this one is lamb, which is a nice, fatty meat. Most of the carbs here come from oatmeal, although there are a few other sources as well. 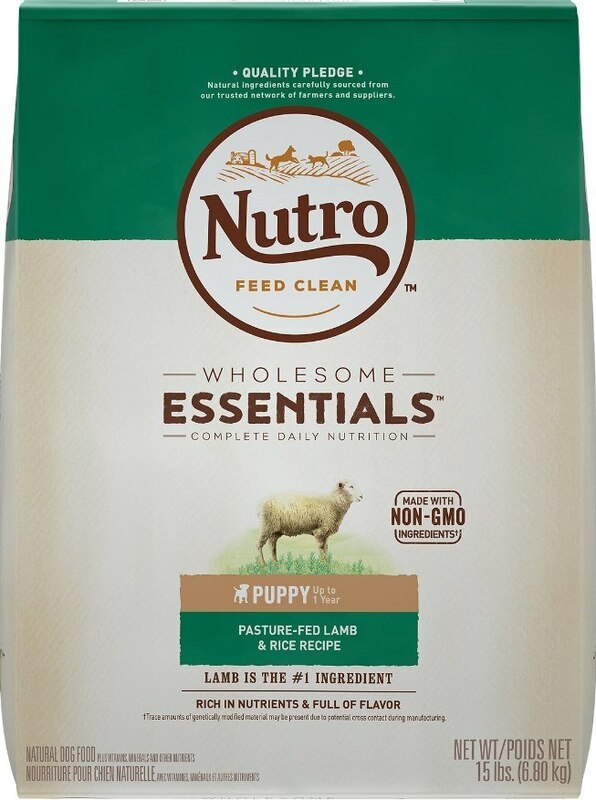 We also like that this particular formula contains plenty of fiber, which can help your puppy digest all that food he’s taking in! We've got a couple articles you might like, by the way. Check out our article dog foods to help your dog lose weight. Or, if you have a large breed puppy, you can prepare for the crazy amount of food he'll eat in adulthood here. We've also got a nice post on grain-free doggy diets and a guide to dog bones. Lastly, we wrote a good guide on the best dog food for French bulldogs.